Dean’s style of clothing is pretty simple, but he always has a few accessories he wears. As I’m sure every Supernatural fan knows, Dean has a silver ring he wears on his right hand on the ring finger. It’s relatively simple, with a groove going down the middle. ​Luckily these can be had for pretty cheap from Amazon. I had to order three different rings before I got the size right. This replica Supernatural Dean Winchester ring (they have a lot of different sizes) is the ring I bought. I also found this replica Supernatural skull bracelet. ​Throughout the series he tends to wear either one, both, or none at all. So pick and choose whatever you want here. Just like with the ring, everyone knows Dean’s necklace/amulet. Given to him as a gift by his younger brother Sam, and used later on in the series (although briefly). ​Dean Winchester’s necklace can be found in a variety of different sizes, styles and of course prices. But I think you can go pretty simple and cheap on this one. ​This replica of Dean's necklace fits the bill nicely. With Dean Winchester’s different watches, there are plenty of options. I know a couple of the exact same kind of watches he wore in the show. But you can also get away with wearing any military/rugged style outdoors watch. ​One of the exact watches he wears is the Suunto Core ﻿wrist watch in all black. If you don’t feel like spending that much money, there are some pretty nice alternatives, like this Fossil ﻿gage plated watch. The Fossil watch is the one I went with. Dean also wears the MTM Black Patriot, which is even more expensive than the Suunto. There are two different styles of this watch, one with a metal band, the other velcro. He has worn both throughout the show. If you want something similar but cheaper, Amazon sells quite a few watches that are pretty close. A search for “special ops watches” shows a lot of watches that look similar, Amazon.com special ops watches (the link shows the search results). If you’re looking for more of a season one Dean look, he also wears a Smith & Wesson S.W.A.T. watch, which is probably the cheapest watch he ever wears throughout Supernatural. Knives may not be everyone’s idea of an “accessory”, but we all know it is for the Winchester brothers. Dean uses a couple of Bowie knives in Supernatural, and I know of two exact makes and models. The first is a Muela Bowie from Phantom Traveler (season one episode four). You can find this Bowie knife on Amazon. The second knife is a Muela Alcaraz Bowie which is used in various episodes throughout the show. You can find this Muela Alcaraz Bowie on Amazon.com as well. Just like how he dresses, Dean keeps his accessories pretty simple. I'm a huge fan of sci-fi/supernatural/monster type shows. After putting together some of my own custom costumes and outfits from TV characters, I decided to start writing my own guides. Did you ever manage to identify Dean’s sunglasses? Rob, that depends on which episode/season you’re talking about, but since I personally wasn’t too interested, I never did research it much. He does wear a pair of oakleys at one point i believe in season 10. He does indeed wear a belt, I thought I had it on this page haha, I’ll link it at the top. But he generally wears a wide brown leather belt. As far as zip vs button fly, I’m not sure you’d ever be able to tell from a screenshot, but I’d imagine they are all zip fly, since most men’s jeans are. Does anyone know what brand and type of folding pocket knifes Sam and Dean carry? Like the one Dean uses in episode “Adventures in babysitting” he & Frank Devereaux prove they aren’t leviathans. Kershaw Storm 2 designed by Onion, I believe. No longer in production, but fear not they are usually available on e-bay, you can also haunt a few flea markets and a few are sure to turn up. ( see the knife and gadget guys, they have all the old/new stock.) they should sell new in box for about 40-50$ American. The knife itself is of excellent quality and a very good value for the money. Mike is absolutely right. I actually should have included that info on this page, but since they’re out of production, I decided not to. I was able to find one myself on Ebay, so keep an eye out and you should find one pretty quickly. I’m hoping someone on here might be able to help? 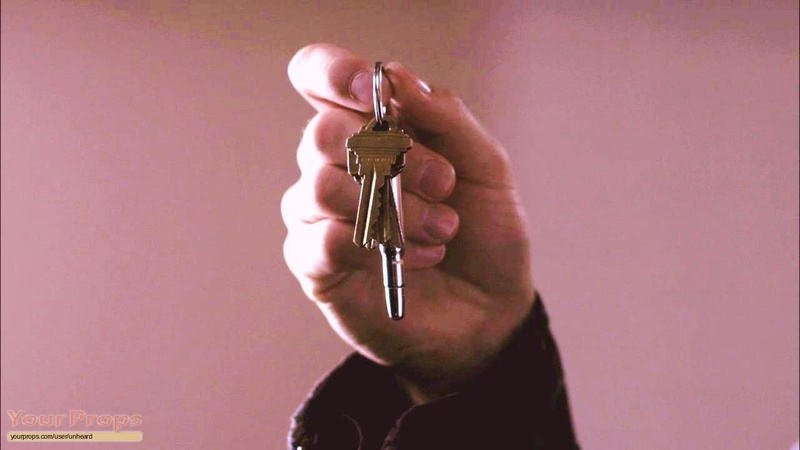 I was wondering if there are photos or if anyone just knows what Dean has as his keyring? For the impala? Is it just the car key, or does he have something on it? Just looking at the picture, I’d guess it is a 30-30 Winchester rifle cartridge with a 159 to 180 grain soft point bullet. Originally designed for the Winchester Model 1894 lever action rifle. Is that all you can tell? Haha, just kidding 🙂 Thanks for the info, Ron. I thought I remembered reading it was a Winchester, but then I thought maybe I was just thinking that because their last name is Winchester. Hey Melissa, do you have any good screenshots of his buckle? What kind of wallet do you think Dean would have? Brown or black leather bifold 🙂 About as manly of a wallet you can get. Wondering if anyone knows generally what length of stubble Dean has. I find I either shave mine too fine, and it looks like ive simply forgotten to shave. Or that I leave it too long and I have the bum look going on. Anyone have any tips on how to achieve that perfect Dean stubble? Thanks for that, Jessica. Yeah, I remember watching that too. Ray, it may just have to do with the speed of your facial hair growth. If you find it looks like its too short, shave the night before with an electric shaver so that its a bit more grown in by the morning/next day. Does anyone know what kind of dagger Dean uses in season 10 episode 9 when the mark of Cain took over? Does any one know what make of machete Dean uses for beheading vamps? does anyone know what watch dean was wearing during season 12 ?